The Academic Staff Union of Nigerian Universities, University of Ibadan chapter, has condemned the statement of Senate President David Mark on the competence of those who negotiated the 2009 agreement with ASUU on behalf of the Federal Government. The union said the Senate President’s remarks ridiculed the leader of the Federal Government’s team, Deacon Gamaliel Onosode. It therefore demanded an apology for Onosode. Mark had last Wednesday derided the government’s negotiators, saying ASUU took advantage of their ignorance. “They (ASUU) found that those who were sent there (government negotiating team led by Onosode) simply didn’t know their right from their left,” the Senate President had said when the strike by ASUU came up for debate on the floor of the senate. At the end of a congress held at UI on Friday, the chapter chairman of ASUU, Dr. Olusegun Ajiboye, asked Mark to tender an apology to Onosode, saying the elder statesman deserved respect from Nigerians. He said, “Onosode is a man of proven integrity, and impeccable character. He deserves better than the colour painted of him by the Senate President. 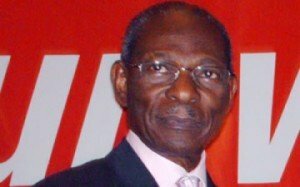 The Congress respects the personality of Onosode, an alumnus of the University College Ibadan, who has served as the Chairman of governing councils of UI and University of Lagos and a successful businessman who has served the country in various intervention capacities. Ajiboye also asked the upper legislative house to be alive and sensitive to national issues, saying President Goodluck Jonathan, who was then the Vice President when the agreement with ASUU was signed, instructed the government team to sign the agreement. He also said that Mark’s statement smirked of disbelief about his knowledge of national issues as he was already the head of the senate when the agreement was signed. Meanwhile, the Socio-Economic Rights and Accountability Project has sent a petition against the Federal Government to the United Nations Committee on Economic, Social and Cultural Rights over the ongoing strike by university lecturers. The petition was sent to the committee through the Office of the UN High Commissioner for Human Rights, Ms Navi Pillay, on October 25, 2013 and signed by its Executive Director, Mr. Adetokunbo Mumuni. SERAP in the petition described the inability of the government to honour its agreement with ASUU as a fundamental breach. It said that though the government in 2009 agreed with ASUU to improve the governance structures and funding for the operation of universities across the country but that conditions of service for members of the country’s universities remained poor. It added, “The Committee should put pressure on the government to promote, protect and fulfil the right to education for the sake of millions of Nigerian children that continue to be denied this fundamental human right. Previous Post: Download BBM on your Android and iPhone Now!